In the southwest of Siberia, is one of the most beautiful places in all of Russia: The Altai Mountains. This mountainous land, where the great Siberian rivers start flowing, is called Siberian Switzerland for good reason! 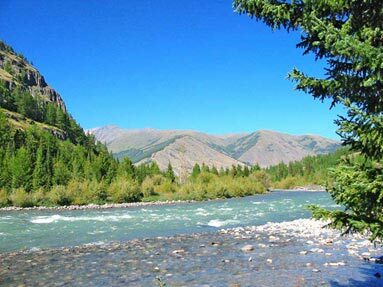 Altai is second to none in the beauty of its landscapes, and in the diversity of its attractions. The Altai has escaped urbanization, remaining unchanged in the diversity of its landscape - limpid rivers, dense taiga, high-mountain meadows, sparkling glaciers, - all features of a gorgeous, majestic, and imposing land! Isn’t it curious that the Altai has the landscapes of almost all the geographical zones of the world? In one trip to the Altai it is possible to see deserted Mongolian steppe, dense Siberian taiga, and the high-mountain glaciers, where during the summer snowfall is higher than during the winter. You can gather a basket of ripe cedar-cones amidst the lofty forests, and half an hour later meet pastured camels on the valley floor! The climate of the Golden Mountains is an ideal mean between the Asian heat and the Siberian cold. July is the most enjoyable month of the summer, when the clear weather becomes settled in the high mountains. The taiga in the Altai is unique, because it’s completely (!) void of mosquitoes! The majority of tourists come to the Altai during the summer time. However, the Altai is also good in autumn, especially in September when one can experience golden larch taiga, dazzling white snow on high black rocks, and clear azure skies! Winter freezes even the fastest rivers - at the bottom of dark gorges water turns into cascades of pale green ice. People who are fond of ski adventures prefer March and April, when the Siberian cold is already gone. The springtime in the Altai Mountains is very sunny. The highest peak of Siberia (4506 m) is located in the Altai, and bears the name of “Belukha”. The three-headed peak of Belukha is a symbol of the peaceful coexistence of three world religions: Christianity, Buddhism, and Islam. The Altaian believed this mountain to be sacred and called it Uch-Semer. The Belokuruha and Teletskoye Lake resorts are famous for their relaxing and inspiring atmosphere: the beautiful mountain landscapes, luxuriant vegetation, an aroma of pine-trees, the bird-cherry trees, the lilac, and the sounds of a mountain river...The main attraction of Belokuriha is its unique, underground sources of nitric-radon water. Enriched with a unique salt and with the temperature of water between 27 and 42 C, it is a wonderful remedy for many diseases. The Altai is one of the few places where all levels of different types of active tourism are available. Mountain-climbing? The first known attempts at climbing the Belukha were made at the end of the eighteenth century. Nobody knows how many undiscovered routes are still to be found! White-water rafting? The river Catun’ is not called “the cradle of water tourism” for nothing. Once, at a time when wooden rafts were used, the river was considered to be difficult and defined the required skills of a true rafter. Nowadays, due to the new means of rafting, there is no need to be a professional to overcome a storm of the Catun’ rapids. Many horseback riding routes cross the Altai Mountains, where you can find mountain bikers, skiers, and speleologists. Siberia is the terra incognita of Russia. The Altai Mountains, the heart of Siberia, are waiting for you!